In my ongoing exploration of the social nuances of #AusPol I have discovered some curious Twitter accounts. In the Twitterverse those who tweet longest, loudest and most often are either (a) Socially Savvy or (b) Social Spammers; or in this case (c) Political Social Spammers. 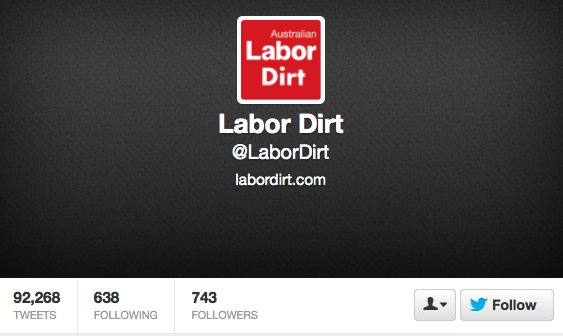 Take for example @LaborDirt – who with only 743 followers is churning out tweets at a rate of knots, effectively spamming the #auspol feed. Let me introduce you to the spambots at work a la @GregHuntMP style as exposed in the Sydney Morning Herald on 21 January 2013. 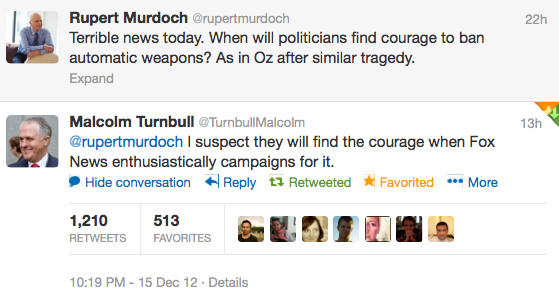 Is Social Propaganda in Australian Politics an effective weapon in election campaigning? Use their social streams strategically and authentically. Generate the news: the minute an interview is published or aired, a correlating social message should appear with links. Resist the urge to respond to social trolls, cyber bullies and spammers; Tweet-for-Tat is never inspiring. If you’re not socially connected to and engaging with your constituency, don’t count on their vote. Like market share, your opponents will have swarmed into the social vacuum left by your absence or silence. Large party backing or small, it’s a numbers game and savvy social spend locally will convert to votes. Download Mashable’s ‘Politics Transformed: The High Tech Battle for Your Vote‘. My blog ‘Social Media and the 2013 Australian Federal Election: And the Social Winner is …‘ provides further insight into why being locally social will benefit a political campaign and convert social spend to political allegiance and votes. What we see in current #auspol spam is a complete lack of strategy. It’s easy for social spammers to forget that their audience is unsecured: they should always work on the ‘one-click-and-they’re-gone’ principle. Spam is not a social strategy. Particularly when that spam lacks currency of information, isn’t interactive and only serves to attack or discredit the opposing party or party leader. It tells your opponent a lot about where you are directing your resources and social spend, making it exceedingly easy to gazump you in the social sphere. Social Sprawl (using multiple accounts for the same brand) dilutes your effectiveness, your brand and your social klout. Socially spamming twitter feeds may not be overtly aligned to a particular political allegiance (or may well be if anyone could actually read the find print in the background theme of @LaborDirt), but the messaging is so overt that you’re insulting the intelligence of social users – the voting public – by pretending otherwise.